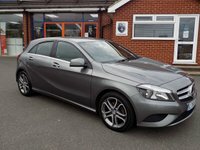 Finished in a sophisticated Mountain Grey, This stylish Mercedes A200 combines sporty looks with great economy, costing just £30 per year in road tax. This car is well equipped with features such as *Speedtronic Cruise Control*, *Bluetooth*, *A/C*, *Sport Seats*, *Electric Windows*, *17" Alloy Wheels* and more. Please ask us for details of our fantastic warranty and finance packages, subject to status, T's and C's apply.